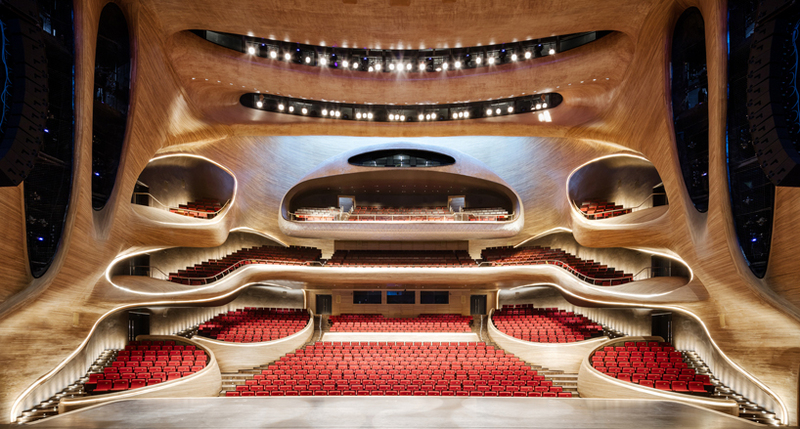 Beijing-based MAD architects have revealed their dynamic design for the opera house in the northern Chinese city of Harbin. Surrounded by the wetlands, the completion marks the end of the five-year construction process which makes the building the focal point of the cultural island. Located on the along the Songhua River, it is embedded into the landscape, with the form of the building echoing the location’s natural elements. It appears as if it was sculpted by wind and water, with the curvilinear and fluid structure wrapped in smooth white aluminium panels. The undulating architectural mass hosts a grand and a smaller theatre which surrounds a large public plaza. 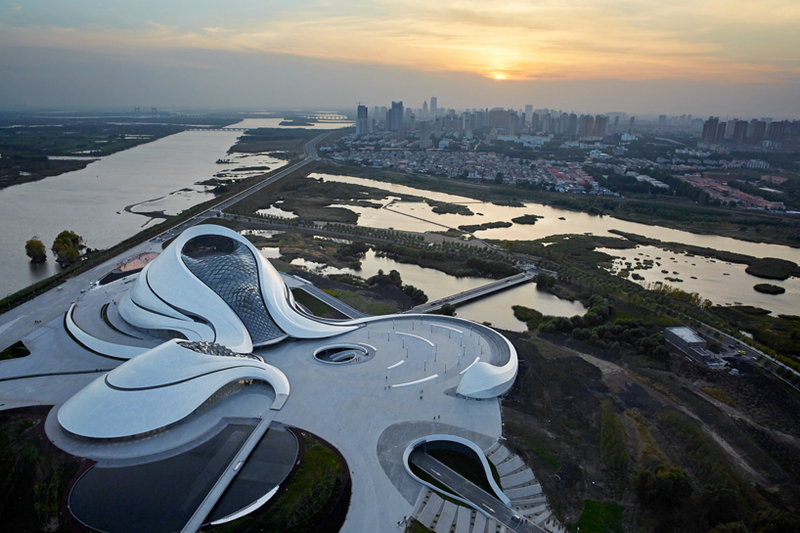 ‘We envision Harbin Opera House as a cultural centre of the future – a tremendous performance venue, as well as a dramatic public space that embodies the integration of human, art and the city identity, while synergistically blending with the surrounding nature,’ comments Ma Yansong, founder of MAD. The sculptural quality continues inside with the interiors clad in a combination of glass and timber. Soaring above the bright atrium, a lightweight diagrid structure supports a crystalline glass curtain wall comprised of transparent pyramids. The surface alternates between smooth and faceted, referencing the billowing snow and ice of the frigid climate. The grand theatre is clad in rich Manchurian ash wood, emulating a timber mass that has been gently eroded away. Timber walls climb up the main stage, wrapping the main stage, which is illuminated by skylights. 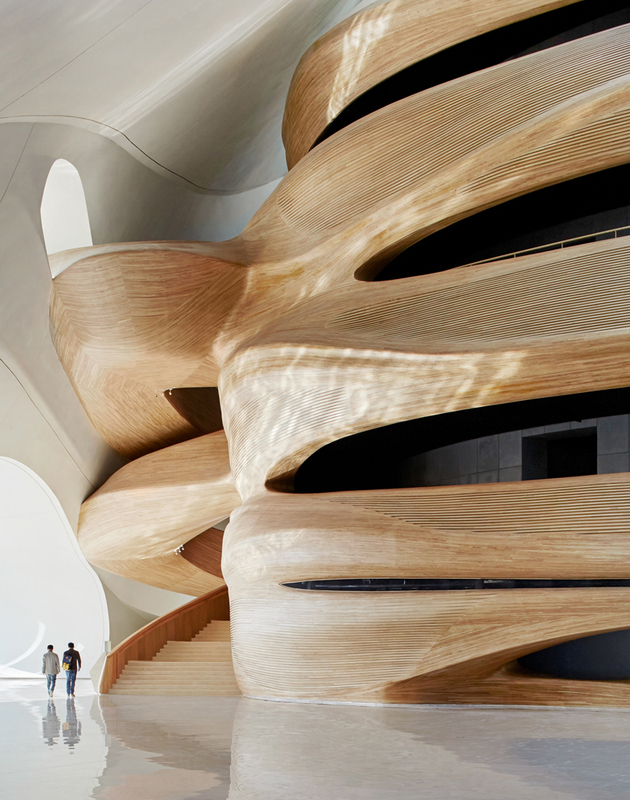 A combination of careful detailing and sensitivity to the local identity, art and culture of Harbin resulted in the organic and sculptural form of the opera house, which will take its visitors on an architectural and theatrical journey. If you would like more information including images, mapping, design team and architectural specs, visit the MAD Architects website. If you have a specific query, phone or email Mad Architects Beijing office via the contact details below.